Roll up, roll up folks…it seems the weather will be good for a little while yet and here comes the neaps again! 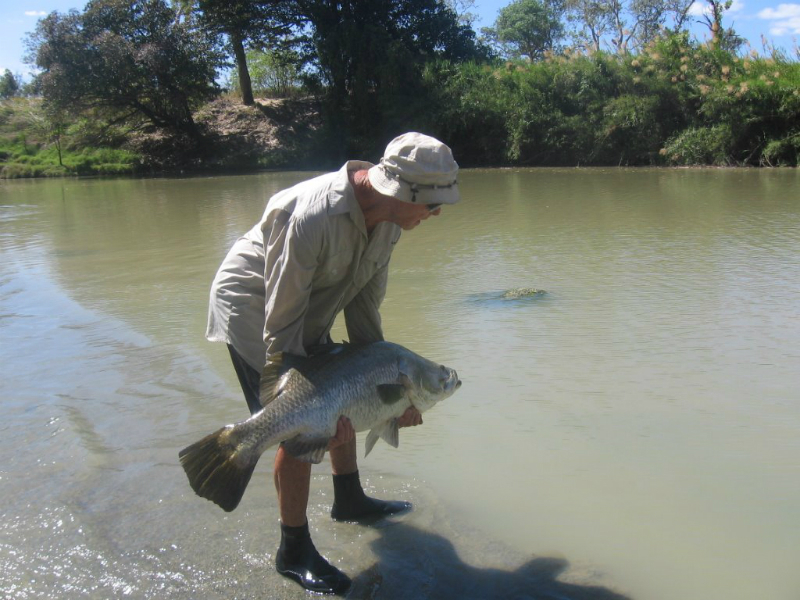 Last week, the springs were good for the land-based fishos with barramundi starting to fire again around our foreshores. Channel Island and Lee Point were the two stand-outs, with saltwater Barra to 69cm engulfing Reidys Junior B52’s with vigour. The big moon and increased water temps have finally worked some magic on the billabong barra too…’HOORAY…ITS ABOUT TIME’ I hear you say….my staffer Robby Rees and crew hit ‘em hard at Corroboree and managed fish to 93cm and a number of other reports included Barra to 83cm ‘exiting the water like guided missiles’ during the night time full moon surface sessions. Back to land-based…..East Point fired for keen fisho David Waite. 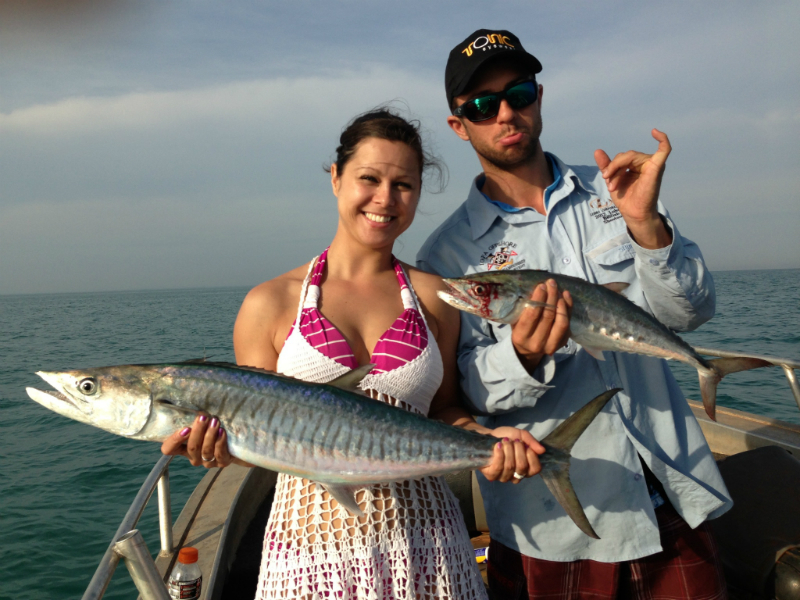 With Milkfish the target, it was mission accomplished with some ripper fish taken on bread baits. It wasn’t without incident however…his first attempt ended in disaster with his drag washers melted to his spool following a blistering run. Enter a new aluminium spool, and the game was back on! On the blue-water, I will predict it a Gulp onslaught this weekend. Both the new Nemesis and Squid Vicious will be working magic on the reefs particularly wide of Dundee, The Perons and around The Vernons. No doubt the barra boys will be hitting Shoal Bay Rock and King Creek for a big one. It should be good…no ‘water temp’ excuses now! Posted in Fishing Reports	| Comments Off on Roll up Roll up…..
How many times a day do you think I hear…’So what are they catching them on?’ With the barra scene currently playing a little difficult, your choice of product can often mean a fish or no fish. Well, here’s a quick skit on what stands out from the crowd at the moment. 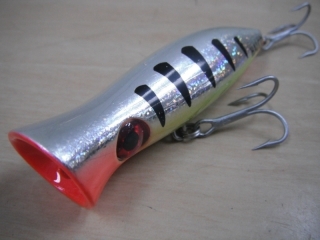 Take a look at the ZEREK LIVE SHRIMP lure in both 89mm and 127mm sizes. Comes pre-rigged with weighted weedless hook, contains an inbuilt rattle chamber, Lumo eyes and segmented tail for realistic presentation. Best fished ‘on the drop’ and with a dead slow retrieve rate. Being weedless, it is perfect for drilling heavy timber but also right at home on the flats. Colours #03 and #08 seem the most popular given their natural colour schemes. The THREADYBUSTER by Smokin Drags & Co. This soft vibration lure is constructed of stretch form elastomer plastic, is rigged using 49 strand wire to support the two VMC trebles and proves irresistible to almost every Top End species when presented correctly. I personally have had Barra sessions whereby if I hadn’t had one on board, I would have gone home fish-less! Available in both 16gm and 20gm versions, you can be specific on sink rates. On the drop, these things dart and dive like a baitfish in real trouble and they jig with surprising action, no wonder they are so successful. Down-sides? With such positive hook-up rates, beware around heavy timber and always carry a lure retriever! In some circumstances it can pay to remove one treble. Berkley GULP 3” Shrimps… By far the biggest selling colour is ‘Green Prawn’ and it is widely used on the harbour flats rigged with a 1/6oz jig head or Squidgy Resin head. Again, a dead slow retrieve will usually net best results. Berkley NEMESIS GULPs are smacking some ripper reef fish of late. These things are a much livelier version of the standard JerkShads and can work wonders fluttering in the current without much manual labour from the angler at all. Best rigged on heavier Nitro Heads. On the Tuna, the standout chromie is the all new Halco Outcast in ‘redhead’. Small 20 gram versions are doing well cast into schools about the harbour. From the landbased locations, queenfish and trevally are responding to the 25gm Silver Gillies Baitfish retrieved at speed. So there’s just a few pointers of what’s Hot at the moment. I hope it improves your catch! Posted in Fishing Reports	| Comments Off on What’s Hot Jock? 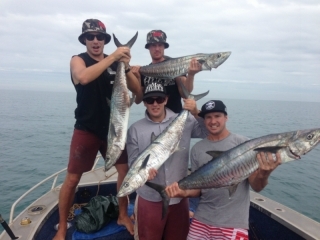 Well it’s been fun and games for the boys from Darwin’s Vision Sportsfishing. Earlier this week, a frenzied pelagic jigging session claimed more tackle than was expected and it therefore came time to improvise. Out came the tool box full of ring spanners and with a little bit of unique rigging the Mackeral were immediately cutting sick on bucket loads of steel. I’ve seen all sorts of things used in place of a chrome slice or jig including kitchen knives, desert spoons, Alfoil and CD’s but surely this takes the cake for dedication….it could get expensive! The Mackeral have kept us alive this year, or at least upheld our enthusiasm and they still keep on coming from most popular locations. One crew were fishing North Gutter at night time and found Mackerel to 12kg in big numbers by jigging 7 inch Gulps on heavy lead heads. Reports from wide of Dundee included one of the biggest Tuna I’ve heard of from around here…try 14kg!!?? Those Zerek Prawns haven’t given up either. Last weekend at The Peron Islands, a local angler was using the smaller sized Zerek rigged on a heavy Nitro head and the reef fish were nailing them with no remorse. In fact, it sounded as if this tactic was far outperforming dead baits. Don’t you love it when that happens…..
Incidently, with the inland barra scene proving tough going, Darwin and Bynoe Harbour have taken the front seat. One of the tricks for success here has been to downsize your gear…even down to 50mm plastics and 45mm surface poppers! Take note of the new 45mm and 60mm versions of the Halco Roosta Poppers now on the shelf. They can be ‘blooped’ as normal or used to partially ‘walk the dog’ for the best of both worlds. If you go this route, be prepared to also downsize your braid so you can cast em the distance….but I’m tipping the rewards will be worthwhile. Posted in Fishing Reports	| Comments Off on Drop The Spanner!! 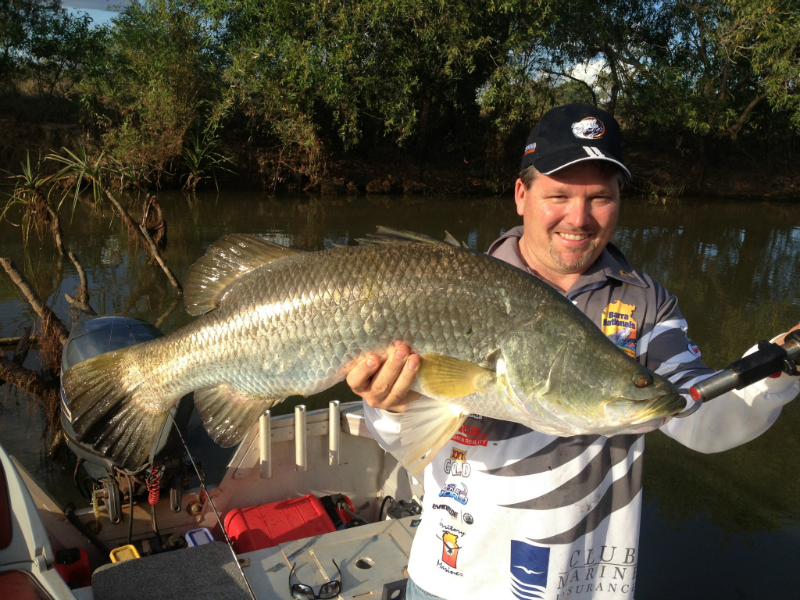 Funny how things happen….all of a sudden, the barramundi reports are coming again. Unlikely we can put it down to any increase in water temps so perhaps it’s just a good set of tides and the building moon. The southern side of Melville has been one of the productive haunts, and it’s been those damn Gulps at it again. This time, the 5 Inch Jerkshads and 3 Inch Green Prawn Shrimps were doing the damage, the trick is to work them ridiculously slow along the mangrove line. 88cm was the biggest but there were plenty in the 70cm range. The Daly….remember that place? Well, I think it’s now worth the trip again particularly on the spring tides with some beaut fish coming aboard via the ‘straight up the guts, gumby style’ trolling at speed tactic. It’s been quiet at The Daly for some time, but hopefully the fish have now decided that they are in fact hungry! Here’s a ripper….visiting from Salamander Bay, David Henry was happily casting his 4 inch Tsunami Pearl/Black Spot coloured plastic upstream at The East Alligator’s Cahill’s Crossing when he got nailed by a monster fish. Following a long fight (all evidenced on Ben ‘WeldIt’ Wright’s GoPro camera) it was captured, photographed and released to fight another day. This fish was a cracker, at 110cm! We’ve been bombarded with Jewfish reports this week too. Again, Melville took the limelight but you certainly don’t need to travel that far. The mouth of Leaders Creek and Saltwater Arm, Shoal Bay Rock, the Town Hall Hole off Channel Island and on a good day Charles Point are all much closer options that have been producing fish. One crew nabbed two 130cm plus Jewfish in an overnighter just off Dundee early in the week, the South Easterly winds providing calm waters for the inshore reefs. 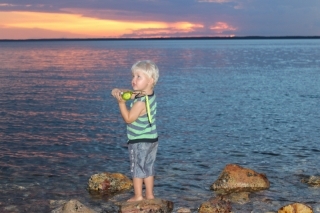 Darwin and Bynoe Harbour neap tide Barra Fishing is still strong also. One crew managed 9 fish, although many smaller than legal size. Another bagged 4 fish, biggest 76cm on the newest of our custom Reidys range of Junior B52’s. The two standout colours were Pump98 and Methanol, both due back in shortly. If it’s Mudcrabs you’re after, relax. You should be able to catch ‘em blind at the moment. All you need is a bit of tidal run, the incoming preferably, leave them for ‘about two beers’ then collect your catch. Tides this weekend will be perfect! 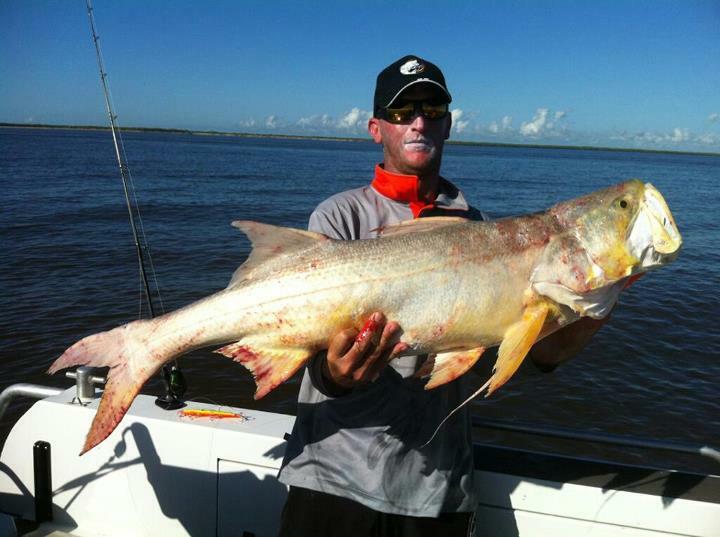 Posted in Fishing Reports	| Comments Off on Big Barra Bounty…. Well for those that just love a big Mack, this should get you salivating profusely. Fresh from the man himself Blake Gilmore, now known as Happy Gilmore, these images are enough to send the blue-water boys into panic. Blake quoted, ‘I have never had fishing like it in my life. It was the most insane day out there…Everywhere we looked there were birds diving, mackies jumping and manta rays going nuts. Got a 5kg Mack Tuna on the Stradic 1000 with 10lb braid…Best fun ever’. And…’Smashed the mackies on Sunday, threw a ton back and got more tuna than I have ever seen’. Need I say more? The Pelagic activity is now there for the taking. Keep an eye on the wind and plan your trip to suit the quiet times. So many options, so little time! Lee Point’s Mack Attack, Bottlewasher, Angler’s Reef and Rick Mills….Dundee’s Long Lost, Loee Patches, Roche Reef all the way to Sail City and beyond you are bound to find surface activity of some sort. While I’m on a roll, you might’ve thought the barramundi were dead and buried for the dry but alas, a few are now poking up for the taking. Glenn Dinwoodie from Top End Barra Series has broken the drought on a number of fish to 85cm from The Daly, Shoal Bay and Darwin Harbour and it appears by his purchases that at least some credit must again be given to those damn Berkley 5” Gulps. Crabs, crabs, crabs…..everyone should be getting Crabs. No offense but they seem to be everywhere, big too! Posted in Fishing Reports	| Comments Off on A Pelagic Nutcase…. Well, seeing as the barramundi are on strike to some degree it’s even more reason to tackle the Bluewater Pelagics. The Long-tail Tuna are now showing up close to home with good sightings and casting sessions taking place just off Emery Point at Larrakeyah. One crew hit ‘em with the new Halco Outcast red-headed slugs and 1/2oz Maribou Jigs in a session that lasted for 10 minutes before the fish went deep. The sneaky sneaky approach is pretty important for these things as they can be very flighty if you get a little keen and power into them. Often the better approach is to sight the school and head up-wind, kill the motor and drift into them. Amongst these powerhouses can be even bigger powerhouses in the form of Mackies, so be prepared to lose some line upon hook-up. High Speed Spin gear really is the preferred outfit for this as a chromie will go out of sight without a bird’s nest, and accuracy amongst a quarter acre school isn’t that important! Our new Avgas Roosta Poppers also burnt a few Mackeral off Dundee last week, the fish around the 10kg mark. That’s not bad! Of course, if these things are in the harbour then they are certainly outside the harbour in even bigger numbers. The Lee Point Reef Systems often hold good schools but possibly the Dundee Wide and Peron locations take the cake for the big footy oval sized schools. Spotting these schools is easy if the birds are working, and obviously flat conditions make it easier again. Wherever your Bluewater assault might take you, make sure you are ready and loaded as it is often a short window of opportunity. In other offshore news, there has been some flat calm reports albeit a little inconsistent. Keep an eye on the weather chart….it’s still South-easterly by the look so our harbours and inshore reef systems would be more likely to strike calm waters. Having said that, The Vernons haven’t been too bad either. Get into it folks, any way you can! Posted in Fishing Reports	| Comments Off on It’s Tuna Time! With a bit of luck, this weekend will be a winner out on the Bluewater. The south-easterly’s don’t look too bad with the afternoon breeze back to 10-15knots. Certainly the inshore reefs off Dundee would be a good choice for some bottom bouncing action and as we come back off the big springs and the big moon gone, I’d predict some tasty results. Grab some of the Gulp Squid Viscious plastic baits, rig them on a 3/4oz jig head and try them alongside your usual fresh baits and see what happens…. many people are pleasantly surprised. While talking Dundee, the Tuna and Mackeral have been out in force so be prepared with some chrome slices and fast troll minnows for these powerhouses. If you’re real keen, it would also pay to rig a few skipping gar for a chance at a Sailfish out a little wider. To the north, Loee Patches is a quick trip for Goldies and there’s a heap of rubbly reef adjacent to Dunimmirie Island that’s always worth a drop for reef species. Closer to home, these tides look manic for Spaniards at Lee Point. Anglers Reef rarely fails if you get the good oil slick and berley happening with a drifted Pilly or Sandmar rigged on gang hooks. Sometimes there’s no need for a float or sinker, just let it spin it’s thing mid-depth and make sure your drag is set for an initial hook-up because you can be sure the strike will happen while the rod’s in your rod-holder. Within our harbour (and Bynoe for that matter) the Blue Salmon have been active almost anywhere you find some shallow reef. Pilchard baits work well for these and it often pays to use a running sinker rig on a sandy bottom nearby as I find the Salmon love scrapping it up off the bottom. On the barra scene, what should I say….The Daly is anybody’s guess. It occasionally fires for two days on the big tides and then goes into shut down mode until it feels randy again. This year there really is no pattern to it. It’s more a matter of ‘having a crack’ and see what happens. Inland, mixed reports from the Billabongs. Hardy’s has been kind to some, including me but it’s taken some sneaky plastics like the Zerek Prawn to entice them. Corroboree a little hit and miss although some crews are coming home quite satisfied. Whatever you decide to do, it’s gotta be better than working! I think the Bluewater Season is set to be a cracker. 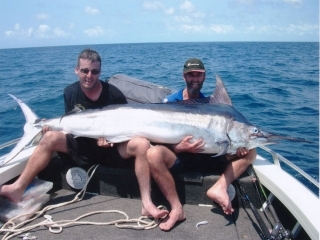 The reports so far have echoed Sailfish in large numbers, the odd Marlin including a monster landed off Dundee last week, Red Emporer, Goldies, Trout and Jewfish to name a few. 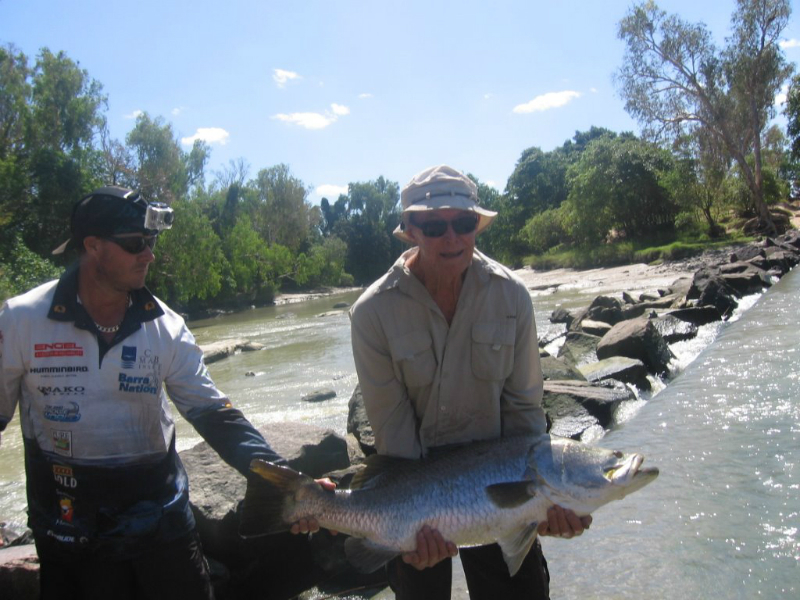 The Jewfish have been big buggers too….up to 18kg I am told! If we could gather any positive from a poor wet season, it might be that the reef species have come in a lot closer than previous….that being that really good sized Golden Snapper, Jew and even Coral Trout have shown up in Darwin Harbour and in around the inshore reefs about Dundee and Bynoe. As a general rule, previously you had to do the miles to find the big ones but I’m being told time and time again that it isn’t the case this year. Talking Jewfish, Saltwater Arm has been a ripper with fish coming on shallow reef sections as a bi-catch while trolling for barra and Channel Island’s Town Hall Hole has played host to busting 100lb handlines on big Jew and the occasional heavy shark. Keep an eye on the weather reports. I’ve noticed the early morning quite calm and the early afternoon starting to get ugly so may be best to go early and keep it short and sweet. Crabs….game on really. Shoal Bay, West Arm, Middle Arm and Saltwater Arm is all go on the bigger tides. Barra-wise, the inland billabongs are holding up water temps well and some nice fish are being caught particularly during the new moon period. 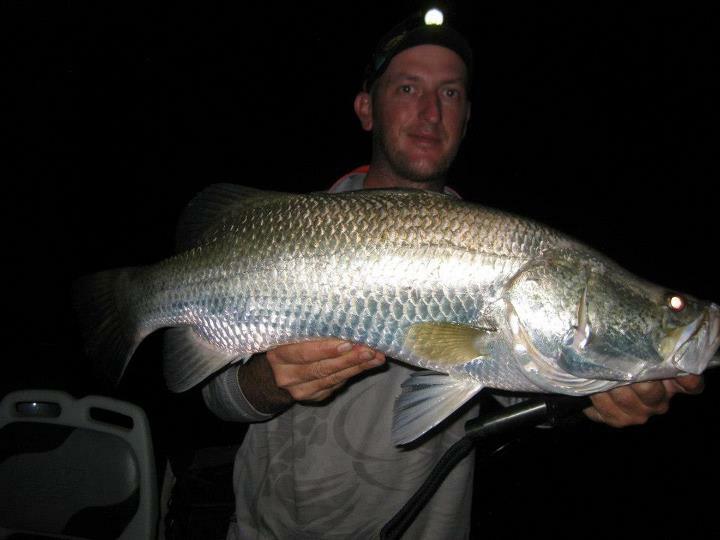 Last night I shot to Hardy’s Billabong for a few hours…..84cm was the biggest, taken on a 15A Green Bling Bomber cast around the Pandanus. The Daly River has proven to be a big tide affair only of late. Wait for the saltwater push and hit the fast trolling straight up the guts for your chance at a metrey. Bring on the dry season…..I’m yet to feel it arrive! Well it’s another one done and dusted, in fact my 10th Barra Nationals, and what a week it was. To say it was tough would be an understatement but I can honestly say it will go down in my record book as perhaps the most enjoyable one ever. Some fellow competitors would find that hard to believe…weather-wise it was the hottest one ever, so much so you couldn’t stand barefoot on the carpet floor! Which brings me to my point….should it be DOOM and GLOOM just because the fish aren’t on the bite? I think not. It was time to have some fun so that’s exactly what we set out to do…out came AC/DC, Van Halen and Dire Straits, a hint of Beer and Wild Turkey and things couldn’t have been better. Congrats to Team Cunning Stunts for their line honours. A well-deserved win resulting from stunning persistence, patience, a ‘match the hatch’ mindset and a boat load of skill to boot. I’m already prepared for next year! In other news, I just love to see kids getting into the world of fishing. Check out young Nathan Tait, all of two years old…. about to unload a monster 17A Bomber from his outfit. Now isn’t that a breath of fresh air from the usual ‘Metrey’ photo…..now I think of it…I think Nathan is a metre tall! Wow! Feel that dry season air in the mornings….how good is that! Straight away I am reminded of those freezing cold early mornings shooting down The Daly with jumpers on, and here it comes again…the Barra Nationals is approaching fast, if a little too fast as the river still sits proud at 13 metres. Luckily, all locations behind it are beginning to fall, so I’d blame the big spring tides for holding it back. Come next week you would think it will drop fast….but what will be will be. With destinations a little limited of late, It’s no surprise that Shady Camp copped a good touch up with up to 60 boats working the mouth of Sampan at any one time. Assuming at least two lures are in the water from each boat crew, that’s a minimum of 120 lures swimming at the mouth. As you would expect, fish were caught with many over the metre mark and as big as 121cm reported! On the South, I’ve heard of numbers of small fish coming from Nourlangie Creek forks and floodplain edges but yet to hear of any rockbar activity. 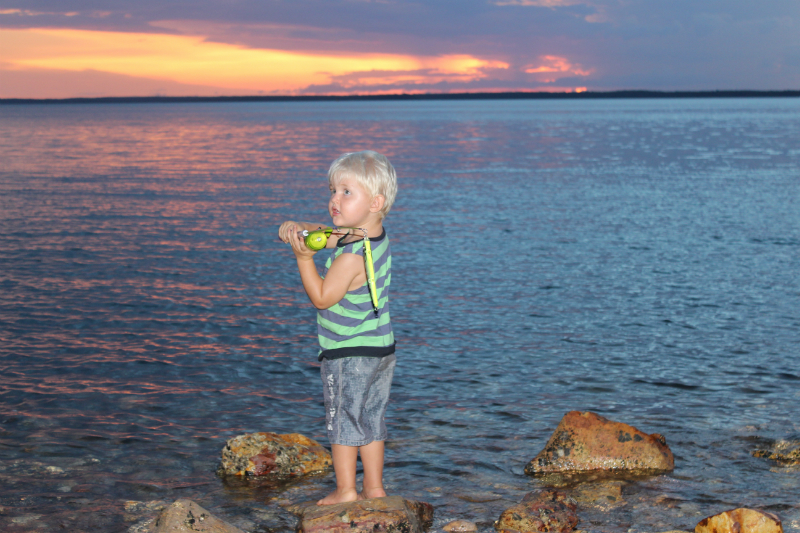 The most common question of late….”Where can I go fishing and get away from the crowds?”. Well, where there is run-off there is normally a decent crowd so if fishing by yourself is important, think tidal water or travel afar. While many chase The Daly and Shady, our own Shoal Bay would be a good choice. With so many options up around the Little Howard and the like it can be bonza fishing there as reports of late have shown. How ‘bout Bynoe Harbour? Take a close look at Matt Flynn’s latest NT Fishfinder Magazine….zone in on the likes of Phoenix Inlet and you will find the world is your oyster. A huge harbour not far from home, neap tide flats fishing at its best…Bynoe is full of opportunities for both Barra and Bluewater fishing, rocky headlands around Indian Island holding big coastal barra, queenies and trevally and the outer reefs are prime for reef species, Tuna and Macks. You don’t have to follow the crowds…… Be different, think different and you might just discover a new angle of approach for the time we call ‘run-off’. By the way, the Big 17A Green Bling Bombers are here……come and get ‘em! Posted in Fishing Reports	| Comments Off on Daly On The Drop!